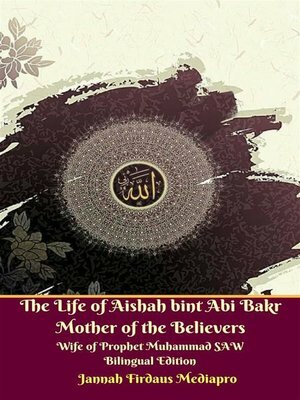 The Life of Aishah bint Abi Bakr Mother of the Believers Wife of Prophet Muhammad SAW Bilingual Edition In English & French Languange. The life of Aishah is proof that a woman can be far more learned than men and that she can be the teacher of scholars and experts. Her life is also proof that a woman can exert influence over men and women and provide them with inspiration and leadership. Her life is also proof that the same woman can be totally feminine and be a source of pleasure, joy and comfort to her husband. She did not graduate from any university there were no universities as such in her day. But still her utterances are studied in faculties of literature, her legal pronouncements are studied in colleges of law and her life and works are studied and researched by students and teachers of Muslim history as they have been for over a thousand years. The bulk of her vast treasure of knowledge was obtained while she was still quite young. In her early childhood she was brought up by her father who was greatly liked and respected for he was a man of wide knowledge, gentle manners and an agreeable presence. Moreover he was the closest friend of the noble Prophet who was a frequent visitor to their home since the very early days of his mission. Aishah bint Abi Bakr (613/614 – 678 CE) was one of Prophet Muhammad SAW. wives. In Islamic writings, her name is thus often prefixed by the title "Mother of the Believers" (Arabic: umm al-mu'minin), per the description of Prophet Muhammad SAW wives in The Holy Qur'an.Aisha had an important role in early Islamic history, both during Muhammad's life and after his death. In Sunni tradition, Aisha is portrayed as scholarly and inquisitive. She contributed to the spread of Prophet Muhammad SAW message and served the Muslim community for 44 years after his death. She is also known for narrating 2210 hadiths, not just on matters related to Prophet Muhammad SAW private life, but also on topics such as inheritance, pilgrimage, and eschatology. Her intellect and knowledge in various subjects, including poetry and medicine, were highly praised by early luminaries such as al-Zuhri and her student Urwa ibn al-Zubayr. Her father, Abu Bakr, became the first caliph to succeed Prophet Muhammad SAW, and after two years was succeeded by Umar ibn Al-Khattab. La vie d'Aishah est la preuve qu'une femme peut être beaucoup plus instruite que les hommes et qu'elle peut être l'enseignante des savants et des experts. Sa vie est aussi la preuve qu'une femme peut exercer une influence sur les hommes et les femmes et leur fournir inspiration et leadership. Sa vie est aussi la preuve que la même femme peut être totalement féminine et être source de plaisir, de joie et de réconfort pour son mari. Elle n'a pas obtenu son diplôme d'une université, il n'y avait pas d'universités en tant que telles en son temps. Mais encore aujourd'hui, ses énoncés sont étudiés dans les facultés de littérature, ses déclarations juridiques sont étudiées dans les facultés de droit et sa vie et ses œuvres sont étudiées et recherchées par les étudiants et les professeurs d'histoire musulmane comme elles le sont depuis plus de mille ans.